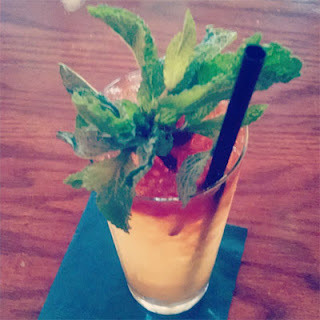 So I went into work the next day and made a Swizzle variation of the drink. I had not made a gin drink up in a while so I reached for that, but whiskey or especially Scotch might work well here too (or rum if the citrus was switched to lime). For a name, I thought about riffing on the concept of the Sinnerman song by paying tribute to Nina Simone or other performers who helped to make the piece popular. Instead, I decided to pay honor to the original drink that I riffed off of. Once made, it shared a mint and allspice aroma. A lemon and grape sip led into an earthy, gin, and allspice swallow. Like the original, the combination had layers of flavors that revealed themselves as the ice in the drink melted over time.